Posted on January 17, 2012, in Mail and tagged access control, Apple mail, can't, doesn't, first aid, forget, forgets, keychain, Mail, mail.app, OK, passed, passwords, remember, repair, save, verify, won't. Bookmark the permalink. 24 Comments. Wonderful information. Detailed. Step by step. And solved the problem. Wish I’d seen this post before driving 150 miles roundtrip to the “Genius” Bar! 10.8.2 problems. Mac Mail doesn’t remember passwords. I have tried all the steps in this thread. Are there any other suggestions? I can send and receive mail from one ISP, but not from another and also can’t log in to my FTP accounts for web work. And yet, all my mail is accessible through web-mail, but my computer can’t send or receive. I currently use Mail2web.com. Thanks for any suggestions. Thank you, Thank you, Thank you! I have been trying to fix this ever since I got this computer. 2 YEARS! I have tried every concoction of settings I could find. This is the first one that actually shows that it saved a password. Yay! Genius. I’ve been trying to fix this problem for months. Many thanks! Just as another suggestion, I had many problems with connecting to my Yahoo account through Mail. It happens every few months. I eventually realized that it was because yahoo was requiring an anti-spam sign in (Captcha) and Mail was not handling it. So I have to go in every few months and manually sign in from Yahoo.com and fill in the CAPTCHA. Not sure if this helps, or even makes sense, but it works for me. This didn’t work at all for me. Is this specific to Lion? Mountain Lion? I did exactly as suggested – first step said nothing was wrong. I went and added Mail and it did ask for my admin password – did this for anything that was email or ical related as I also get frequently asked for ical passwords also, and when I returned to mail to add in the passwords again, they still wouldn’t save. Any more suggestions? Cheers! Thank you Phil for the advice on how to fix my Apple Mail — it worked straight away. Mail not accepting my password happens about every three months or so. In the past, if I wait a couple of days it seems to self correct. All a bit magic to me! Thanks to you, I can now pick up emails that have been waiting around. Three separate machines, ML 10.8.1, mail does the PW loop not long after opening and working elsewhere. Eventually, all will start the doₒp of requesting the same PWs over and over. If I open KeyChain Access before this starts, there are password documents visible under “Login”. If I open Keychain Access after the cycling starts, no such mail related documents are presented. If everything is good and I do a KeyChain First Aid, those Password documents disappear after. When I reboot, all is happy again and Keychain Access shows all the lisitings it should. Any ideas? Try repairing system permissions and resetting the ACLs. I have had ongoing issues with messages asking for me to re-enter my password on Mail for several weeks. It was driving me crazy but, your solution has fixed it. Thank you! Help!!! Hi Phil, I wish I had come across your solution sooner. I was having the same problem, started googling, & unfortunately, I took someones else’s advice and have somehow deleted all of the saved “password entries” in my keychains. i.e. the mail keychains of imap/stmp/pop. So now there is nothing in my keychains. And now when I go back to my “Mail preferences” and try and enter in my password, then save it, it won’t!! I’m now completely lost. You have helped me before with unistalling Mackeeper, please help again. do you have any Time Machine or Clone backups? If so, you can replace those keychain files. Let me know if you need help on how to do that. If you don’t, please quit Mail. Make sure Mail is not in your login items, or if it is remove it ( > System Preferences…> Users & Groups/Accounts | Login Items). Restart the computer and log in. Open Mail. Go to Preferences | Accounts and enter your password details. Close the preferences box and choose ‘Save’ when asked to save changes. Quit Mail. Restart the computer. Open Mail, click ‘Get Mail’ in the Taskbar. 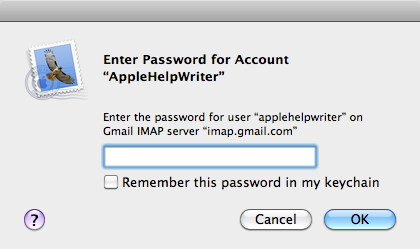 Does it connect to your IMAP server or ask for a password? Once again Phil you have saved the day! I don’t have time machine (is that something I should look into?) Anyway, i followed the other steps, and i think it has worked! So far so good. I will let you know if I run into anymore problems. Thanks once again. These mac computers can be frustrating at times!! Thank you this worked for me, was having the same problem with Mac Mail, after a Time Machine restore.